The SAS Book Club recently discussed the expanded version of Boyer’s 1990 seminal work Scholarship Reconsidered with the view to interpret the importance of his work for the University of Phoenix in general, and more specifically for the School of Advanced Studies and doctoral studies. Boyer’s criticism of the status of scholarship during the 1970-80s stemmed from the sole focus which was placed on research by faculty and that reward systems were based on how much faculty published. This emphasis essentially resulted in removing faculty from the classroom and their primary responsibility of teaching and service. Boyer (2016) convincingly argued that a too narrow view of scholarship was embraced based solely on the evidence of publications. He subsequently proposed a broadening definition of scholarship. Boyer’s (2016) expanded view of scholarship includes the four domains of Application, Discovery, Integration, and Teaching. Boyer (2016) stated that “the work of the scholar also means stepping back from one’s own investigation, looking for connections, building bridges between theory and practice, and communicating one’s knowledge effectively to students.” (p. xxii). Discovery – Original research and publication. Integration – Scholarship conducted across domains which involves synthesis of information across disciplines, across topics within a discipline, or across time (Moser & Ream, 2015). Teaching and Learning – The pursuit of systematic study of teaching and learning processes (pedagogy). Boyer’s Four Domain Model of Scholarship has been largely incorporated into the University of Phoenix’s educational model. How this will be applied within the various schools and colleges is still being refined to meet the needs of each discipline and degree level. However, the book club participants agreed that the focus and emphasis of the different domains of scholarship will differ from school to school and at different levels of teaching. Such a view is closely aligned with Moser and Ream (2015) who argue that Boyer’s four domains “are a call for scholarship to be diverse and flexible enough to serve the common good and advance higher education in the ways it needs to be in order to thrive.” (p. 22). In the School of Advanced Studies and doctoral research, being spearheaded by the Research Centers, it is expected that the focus will be on the domain of discovery. Boyer poignantly pointed out that scholarship once was measured by the ability to think, communicate, and learn (Moser & Ream 2015). These principles are the keystones of the Scholar-Practitioner-Leadership (SPL) which is advocated by the School of Advanced Studies. Although discovery is the main focus of doctoral research, this should not be to the detriment of the other domains as the SPL model is an attempt to have a more balanced approach to scholarly work by developing independent thinkers and practitioners. The dominant place that universities have occupied in higher education and in the advancement of research and knowledge will come under much more scrutiny in future. Dorothy Leonard-Barton argued in 1995 that universities and places of higher learning are no longer the only ‘wellsprings of knowledge.’ Many organizations and consulting houses are undertaking their own high level research to improve businesses and societies. This will be even become more relevant in an information age where the access to information has become so much easier to undertake research. If traditional research universities fail to meet these demands, their relevance will increasingly being questioned. There are many evident synergies between Boyer and other frameworks such as Kolb’s learning Cycle, Mumford and Honey’s (1986) learning styles and Revans’s (1982) Action Learning model. Boyer’s model has the flexibility to advance education at various levels of complexity. 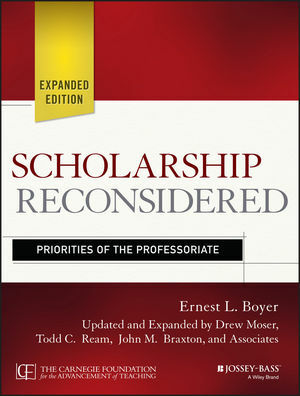 As scholar-practitioners the School of Advances Studies should look forward to advance Boyer’s principles of scholarship through the SPL model as these are not only closely aligned with the mission and vision of the University of Phoenix, but are part of the larger changes happening in the Information Society. Boyer, E.L. (2016). Scholarship reconsidered: Priorities of the professoriate. Expanded Edition. Moser, D., Ream, T.C., Braxton, J.M. & Associates. Jossey-Bass. San Francisco, CA. Kolb, D.A. (1983). Experiential Learning: Experience as the Source of Learning and Development. Prentice Hall; 1 ed. London, UK. Leonard-Barton, D. (1995). Wellsprings of Knowledge: Building and Sustaining the Sources of Innovation. Boston, MA: Harvard Business School Press. Moser, D. & Ream, T.C. (2015). Scholarship Reconsidered: Past, Present and Future. About Campus / March – April 2015. Wiley Online Library. DOI: 10.1002/abc/21181. Mumford, P. & Honey, A. (1986). Manual of Learning Styles. Peter Honey Publications. Revans, R. (1982). The origins and growth of action learning. London: Chartwell-Bratt.